The Hispanic, Black and Asian American market segments, until recently referred to as minority groups, are rapidly growing in numbers and economic influence. In fact, we marketers had to drop the term “minority” altogether and call these segments what they really are: emerging majorities. The women of these emerging majorities are looking for brands that view them as a significant part of the future of the U.S. consumer market and already reflect the mix of their many cultures in the goods, services and marketing messages they deliver. It may feel like the major growth among Hispanics, Blacks and Asian Americans has snuck up on us, but it really hasn’t. The shrinking of the Anglo American majority seems to drive that point home. While Anglo Americans in 1990 represented 87 percent of the total consumer marketplace, by 2007 their market share is expected to decline to 80 percent of all U.S. consumer spending, and this downward trend will continue. Correctly using the many possible terms to describe these segments, like African American or Caribbean American or Hispanic American or Mexican American, is just the tip of the iceberg in training your brain to understand the women of these groups. We’ll start by pointing out the common traits that are generally shared by these diverse cultures and that differentiate them from Anglo culture as a whole. Then, we’ll go into a few more specifics on each of these three ethnicities to help define who these women are and what influences their buying decisions. Whether your market is Hispanic, Black or Asian American women, an “in-culture” marketing approach should be the ultimate goal: The keys to reaching them should reflect their truths as ethnic women, as well as honor the beliefs, traditions and values that differentiate them from women in the general marketplace. Cultures and dialects vary even within each segment.Asian Americans, for example, have roots in countries with cultures and languages as diverse as those of India, Cambodia, and Japan. Acculturation will vary, as well.Women who are first generation immigrants will likely hold much more strongly to the traditions of their homeland than will their daughters or granddaughters. Religion is an important but sensitive topic.Special holy days and celebrations are very meaningful to members of these ethnic populations, but such strong faiths and traditions make it that much easier for marketers to offend (so be wary). Family and domestic concerns remain important.Family gatherings are so traditionally ingrained with most of these segments that representing women from these ethnicities in an overly independent, more Anglocized way, might not resonate. Language may still be a barrier.In response to acculturation levels, an effort should be made to communicate with people of Hispanic, Black or Asian American (or any other) ethnicity in their own language wherever possible. If nothing else, a bilingual approach in ads or promotions will be key for further demonstrating that your brand values its consumers’ cultural heritage. Certainly, you may be able to make an existing campaign more relevant to some of these emerging cultures with minor adjustments in tone. But usually, it will take more effort to craft messages and find images that resonate with the different cultures of these emerging majorities. Honda’s well-done multicultural efforts should inspire us to learn more about marketing effectively to these emerging majorities. Let’s take a quick look at some of the facts and marketing challenges specifically presented by the Hispanic, Asian American and Black women’s markets to help you jump-start launching your own in-culture campaigns. The rapidly growing Hispanic population represents a huge marketing opportunity. According to the U.S. Census Bureau, between 1990 and 2000 the Hispanic population grew 58 percent, compared with Asians 48 percent and African Americans 16 percent. With its buying power growing 12 percent annually, the Hispanic market is clearly one of the most influential consumer frontiers yet to be more fully tapped. Still, advertisers have only recently begun to include this group in their budgets. National retailer Target is one brand that has both celebrated Hispanic culture and supported its youth. In 2002, Target (along with other big-name brands like Hewlett-Packard and Daimler-Chrysler) sponsored “Chicano,” a pair of museum exhibits that will travel to fifteen cities over the course of five years. In addition to the exhibits, performances and other local events, three scholarships per city will be awarded to Hispanic youth. Although the Target-sponsored exhibits may be a good example of connecting with the Hispanic community, it remains a challenge to reach the women of this market, who may or may not be tuned into TV or the Internet. Let’s see, then, what may be influencing Hispanic women’s views of typical U.S. goods and services. Hispanic American women have emigrated from a number of different countries, each with its own culture and dialect. Further, acculturation levels vary depending on how long a woman has lived in the United States. What resonates with a woman of Cuban descent may need to be reworked to ring true with a woman of Mexican descent. And, first-generation Hispanic American women may hold tightly to their more family-oriented, hierarchical orientations, while their granddaughters may have already developed less ethnic lifestyles and self-images. Using the term Latina or Hispanic woman depends on her preference and whether she considers herself more liberal (Latina) or more conservative (Hispanic). As it is too hard to guess about what your women consumers prefer, the best bet may be to use Hispanic when addressing them. The younger generations of Hispanic American women add yet another wrinkle. M. Isabel Valdés has found that many of the culture’s teens and young adults are also rediscovering their roots in both their language and traditions. So, the lesson is to never assume we’ve “got it all down” when marketing to women, ethnic or Anglo, because the next generation may well blow our theories out of the water. No matter what acculturation level or language preference, Hispanic women in general have family and household purchases on their minds. With families that often include grandparents, godparents and other relatives in addition to children, a typical Hispanic household’s consumer decisions will likely be made by a broad range of women (including mothers, sisters and grandmothers). Furthermore, Hispanics are known to make shopping a family affair, with more than a third of those surveyed preferring to shop with their families. With the majority of Hispanic Americans holding Catholic beliefs, the many Catholic religious holidays, festivals and celebrations are of great importance within this culture and for entire extended families. Interestingly, Hispanic community loyalty may not necessarily translate into shopping preferences: Only 26 percent of Hispanics say they’d prefer to shop at a local store over a national chain. In our marketing efforts to reach Hispanic American women, how can we incorporate and reflect the significant cultural differences we’ve discussed? Language and acculturation levels, in particular, seem to be key. In the case of the older population, AARP (formerly the American Association of Retired People) has found the two issues of language and acculturation to hugely differentiate Hispanic Americans from the general fifty-plus market. Senior Hispanics may have limited or no knowledge of English, and they are more likely to live out their lives in multigenerational homes rather than in assisted-living residences. For these elder Hispanics, it would seem to be more important to have Spanish-language in-person customer service connections, for example, than in-language ad campaigns. Over time, all new Americans will certainly acculturate to some degree. But, wherever these women fall in the spectrum, from traditionally Hispanic to more Anglocized, it will be worth letting these influential consumers know that your brand understands them. Above all, avoid generalizing about or stereotyping the Hispanic American market. The major cultural and dialectical distinctions within that vast population really can’t be ignored in your marketing efforts. Reflect acculturation differences.Older Hispanic women, or those still adhering to traditional roles, may not pursue work outside the home. So, images of women in business suits with cell phones will not reflect the realities of these women or speak to them. And, stay attuned to the ever-present language barrier: While some 51 percent of U.S. online Hispanics prefer to use English at home, 21 percent prefer Spanish and 27 percent use both languages. The launch of PepsiCo’s Gamesa USA MiniPacks was a good example of in-culture marketing, reaching Hispanic mothers where they would normally be and through the media channels they regularly use. Launched in the summer of 2002, the campaign targeted Hispanic mothers with children under age 12, promoting MiniPacks’ individually packaged cookies, in radio spots, subway car interior ads and newspaper rack headers for La Raza, Chicago’s Spanish-language newspaper. The tagline, “Perfectos Para Llenar el Hueguito” (Perfect to Fill the Hunger Gap), appealed indeed to the emotion-driven childrearing concerns of moms. Show pulled-together fashion and make-up.While T-shirts, jeans and just lipgloss may resonate with most Anglo women, don’t assume the same for Hispanic women. Their culture includes the tradition of family celebrations and, thus, they are likely comfortable dressing up a bit, and doing so more often. Keep family and children in mind.A quarter of Hispanics say their kids have a significant impact on the brands they buy. Furthermore, their typically larger families and greater hospitality concerns may also influence Hispanic women to purchase larger quantities of food and many packaged, ready-to-eat goods. Tap into the local celebrations.As long as you have thoroughly done your homework and can respectfully participate or involve your brand in a religious or traditional celebration (via a sponsorship, for example), such events may be a great way to raise brand awareness among Hispanic women. As for television habits, a study of urban women conducted by Surveys Unlimited found that Hispanic, as well as Black, women are more likely than white non-Hispanic women to prefer cable television channels over traditional networks. Furthermore, Black, Hispanic and Asian women in the same study expressed a greater interest than white urban women in the variety of features offered by digital television services. While Hispanic American women come from many different cultures, they share a somewhat common language. Asian American women, however, may not even have that trait in common. Having emigrated from countries as diverse as Japan, China, Korea, Indonesia, Pakistan and India, they are likely to communicate in a much wider variety of languages or dialects than their sisters from other emerging majorities. As marketers, we have to forget about reaching Asian American women en masse, but instead dial into the particular subsegment that best represents our customers. An Asian American woman’s attitudes and buying behavior, and how these revolve around community and children, may reflect the social status and roles of women in their home cultures. For example, even when they work full-time, Asian American women continue to manage much of the household and overall family finances, just as they would in their home countries. Their cultures may lead them to do what they’ve always done (which is a lot) and to add in all the extras that are also expected of them in U.S. culture! Many of the women in this often highly educated emerging majority will also apply the skills they’ve acquired from years of household management to become empowered to build their own businesses. Their education and business experience may actually make them a bit more progressive in comparison to Anglo American women or to those of other ethnicities with whom they affiliate. Meek, passive, geisha-type characters these women are not. And, along with their education and business experience, these women have some major shopping skills. Asian consumers shop more than other groups, with almost half (43 percent) saying that they always look for a brand name when they shop. But, interestingly, brand consciousness does not necessarily mean brand loyalty, with 25 percent of Asians saying they change brands often, as compared to 22 percent of Hispanics, 20 percent of Blacks and 17 percent of Anglos. Furthermore, Asians are big Internet shoppers. While they are the least likely (compared with whites, Hispanics and Blacks) to buy merchandise by phone or mail order, they are the most likely to shop over the Internet. As a rule of thumb, we highly recommend developing marketing messages that reflect the uniqueness of the many different backgrounds and cultures of Asian American women. Slapping a native language voice-over onto your existing television campaign would certainly not suffice. Images of success resonate.In general, and in all but perhaps the Southeast Asian cultures, younger and older Asian American women alike are image-conscious. So, depict them in successful roles and don’t forget the details of the appropriate outward appearance as well-the finest in clothing or jewelry, for example. Learn and honor culturally specific traditions.Gift-giving occasions may be different for each Asian culture, and therein may lie significant opportunities to reflect your knowledge of the needs of these women and to serve them better. Use the familiar to reach them.Just as women from the emerging majorities appreciate seeing their body types and skin colors represented in your marketing efforts, their cultural pride will be even greater when their native languages are used. Even as they become more acculturated, Asian American women still notice the companies that take the time and spend the budget to produce ads that quite literally speak to them and reflect their realities. And, don’t overlook the 1.5 generation.In the Asian American segment of the country’s fast-growing multicultural population, the 1.5 generation is considered by Asia Link Consulting Group to be the “forgotten” generation that deserves attention. The 1.5 generation immigrated to the United States as children under age 18, brought by their parents who came by choice. The 1.5 generation straddles both the immigrant generation born outside the United States (usually called the first generation) and those who were born here, called the second, third and fourth generations. In Japan, a country steeped in gift-giving tradition, Valentine’s Day has been adapted as “Giri Choco,” which means “obligatory chocolate,” a primarily one-sided gift-giving tradition where females buy chocolate for their male counterparts. On this day, women buy chocolate for their boyfriends, husbands, male co-workers, classmates and their male superiors at work. When the men receive the chocolate gift, they are obligated to return the favor one month later, which is known as White Day. On White Day, unlike Giri Choco, the types of presents men give are more varied. They range from jewelry to candies and flowers. The equivalent of White Day is also observed in Korea, where women give men chocolate on Valentine’s Day and men give women candy a month later. Many Chinese follow the American tradition of Valentine’s Day. However, the Chinese traditionally have their own version of Valentine’s known as “Lover’s Day,” which falls on the 7th day of the 7th month in the lunar calendar. It is a celebration of a legendary love story involving a young mortal cow herder and an immortal weaving fairy. The Chinese believe these two lovers were separated by the Heavenly Mother and can only be reunited once a year, on the 7th day of the 7th month, when a bridge of birds will be formed in the sky. On this particular day, some Chinese still cherish this traditional festival and celebrate it with loved ones by buying flowers and other gifts. The Japanese who adopted this Chinese myth celebrate the same holiday and call it “Tanabata-sama.” In Japan, it is celebrated to this day with an annual street festival and involves the decorating of small bamboo trees with origami, where people write their wishes on oblong strips of rice paper and hang them on the trees. Asian Americans are a very diverse ethnic group and they have different traditions and observe different holidays. It is important for marketers to understand and be sensitive to their individual customs and traditions when planning promotions and ad campaigns targeted to each group. Do U.S. companies adequately address the concerns and market needs of Black Americans? This sensitive issue has been getting more media coverage in recent years. And, while there has been a noticeable increase in the number of Black actors and models represented in ad campaigns, this minority and emerging majority, which includes a broad range of dark-skinned ethnicities, may still feel underserved. Like all women, Black women rightfully expect to feel respected as consumers and to be invited to partake of your brand. In general, if you respect their community and church involvement, and reflect those values that they hold dear, the women of this segment will be more inclined to focus their buying on the products and services you present to them. According to recent reporting by Newsweek, 35 percent of Black women go to college as compared to 25 percent of Black men. Furthermore, “College educated Black women already earn more than the median for all Black working men-or, for that matter, for all women.” This seems to set the stage for much of their consuming behavior-Black women are educated, they make the money and they manage the household. Household management and family purchasing decisions, from groceries to automobiles, are more often made by Black women, as opposed to Black men, than is the case for the general marketplace. In 2002, the Fannie Mae Foundation found that more than two-thirds of African American women (68 percent)-compared to 55 percent of women overall-said that they were the only one who handled the household financial planning and budgeting. Furthermore, African American women tend to have more financial responsibilities because they are less likely than women overall to be married. According to the 2000 U.S. Census, 47 percent of Black women in the thirty- to thirty-four-year-old age range have never married, compared with 10 percent of white women. Yet, these single Black women are adopting children in record numbers. The U.S. Department of Health and Human Services found that 32 percent of children who were permanently adopted through public adoptions in 2001 were adopted by single women, with over half (55 percent) of them Black women. Overall, there is great diversity of experience and expectation among Black women, depending on country of origin-whether African or Caribbean-and life experiences. Some experienced the changes of the Civil Rights era, while others did not live through that powerful time of transition. The level of a Black woman’s sense of entitlement, which could greatly affect how she goes about making consumer purchases, might well depend on whether her experiences include years living under segregation or in a socially diverse environment. Finally, of the three groups of women we’ve profiled in this chapter, Black women may be the most conscious of style. In fact, 34 percent of Black consumers say they like to keep up with fashions and trends, as compared to 28 percent of Asians, 27 percent of Hispanics and 25 percent of whites. Keeping the tone of a marketing message respectful and positive is a good place to start with any group of women, of course, but it’s especially true in the case of Black women. As with the other emerging majorities we’ve covered, marketers should do their subsegmenting homework to reflect the key lifestyle factors of their customers in their promotions and messages. Demonstrate your commitment to their communities.Sponsoring a neighborhood event is an effective grassroots method for connecting with Black women. Use local media channels (billboard ads, for example) as a powerful way to forge connections with these women. Furthermore, Black women often consider the churches they attend their true community centers. As reported by DiversityInc magazine in late 2001, “Church, for many African Americans, is far more than a place of worship. The church may double as a health center, school, bookshop, counseling center, job-placement center, early childhood development center and more.” Though some marketers may try hawking all sorts of goods at African American churches, business should never interfere with their spiritual and religious purposes. Value their lifestyles and cultural diversity.While older Black women may have lower expectations for inclusiveness in ad campaigns, their daughters or granddaughters are more likely to expect marketing messages that reflect their experiences with racial and cultural diversity. They also expect to be included or represented in ad campaigns as the businesswomen, students, athletes and mothers that they are. Tap into their popular cultural interests.The music and fashions of Black teens have been hugely influential in the early twenty-first century, and Black female musicians, in particular, are much more visible (and successful) than in years past. Using these cues and tapping into Black popular culture within your marketing messages will reflect your brand’s to-the-minute knowledge of their interests. Reflect their use of media channels.The community focus of a Black woman’s life is visible in the pages, on the sites or in the broadcasts of the variety of culture-specific media channels she uses. Interestingly, however, their culturally specific newspapers seem to be losing the battle for attention with this emerging majority, just as newspapers are losing ground with the general public. The media channels most often used by Blacks now include mainstream media in addition to Black-oriented magazines, radio stations, television programs and Web sites. Because the consuming ways of Anglo American women have just recently come into sharper focus for many marketers, we may too easily default to marketing to them when developing a new campaign. But, the facts are in: Hispanic, Asian and Black Americans are the three key markets poised for major expansion in the United States during the coming years. Knowing what we do about how much women, in general, influence consumer spending, it behooves us as marketers to focus in on what makes the women of these ethnic groups see our brands clearly and positively. Our marketing efforts should become in-culture in step with a marketplace that now has an increasing number of skin colors and cultures. There is so much to learn about female consumers in the emerging majorities that you can’t just dip your toe in the water. Rather, you’ve got to dive in and fully commit to continuing your education in how to reach them. Do whatever you can to discover what cultural cues might be influencing their view of your product or brand. When they see your brand reflecting their culture and community-through event sponsorships, in-language billboards or ethnically specific offerings (such as food products) – that’s when the women of these hugely influential markets will stand up and take note of what your are doing. And, that’s how they will all get the best perspective of what your product or service has to offer them. aef.com is grateful to AMACOM Books for granting us permission to post this excerpt. 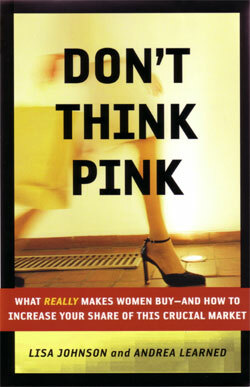 Excerpted from Don’t Think Pink: What Really Makes Women Buy – and How to Increase Your Share of This Crucial Market by Lisa Johnson and Andrea Learned. Copyright 2004 Lisa Johnson and Andrea Learned. Published by AMACOM Books, a division of American Management Association, New York, NY. Used with permission. All rights reserved. Copyright © 2004 Lisa Johnson and Andrea Learned. All rights reserved.